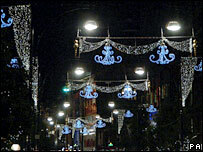 Concerns have been raised about the amount of energy used by the Oxford Street Christmas lights. On Thursday girl band All Saints switched on the lights on the shopping street. The 260,000 bulbs will be on 24-hours-a-day until 6 January. Organisers said they were using low energy bulbs and consume 50% less power than four years ago. But Liberal Democrats on the London Assembly have called for renewable energy to be used. Mike Tuffrey, of the London Assembly Liberal Democrats, said: "It's great there are lights and it's great they are going to be low energy but this whole exercise of lighting up Oxford Street is going to put out 80 tonnes of carbon dioxide. "We think they (the organisers) should go that bit further and make the thing carbon neutral by using renewable energy." He also proposed organisers spend £4,000 to buy 400 trees to offset carbon emissions. Jason Tyrrell, of the New West End Company, said they had done an "enormous" amount to cut energy usage by 50%. "Let's remember the lights are a major draw for London. We have over 40 million visitors coming from London, the UK and overseas to come and see these lights." He said the lights remained on 24 hours a day was because people came at "all sorts of times" to see the lights.